"What are you doing?" "Shopping.."
yesterday I saw this blouse and my brain said: „buy it, immediately!“. So I bought it. It’s from COTTON ON. I know this shop for a while now and they have great sales, that I normally pass by to see if I grab some stuff. 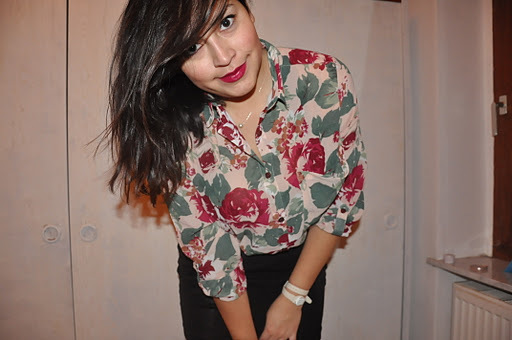 In fact this blouse matched my new SEPHORA lipstick (called „Crush 23“ you can find it here) ! I love Sephora, i think it is my favorite cosmetic store! It all looks very redish, but in real it is more velvet. Faux of the cam lightning. Anyway I am just freaking out a little bit with buying and spending my money. Also I wanted to have the new watch from swatch. And how you allready guessed. Yeah.. I bought it, too. The only thing I did not shopped is my necklace. It is really nice because you just see the pearl, the rest is sheer. It is just a little suga daddy spending phase , iI think haha. Everybody has one!